President Uhuru Kenyatta mingles with passengers on surprise SGR trip to Mombasa. 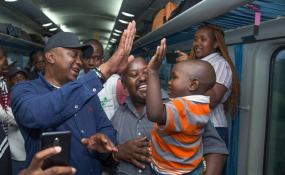 President Uhuru Kenyatta on Sunday morning surprised passengers in the Mombasa-bound SGR train for a meet and greet experience that excited many of the onboard travellers. Accompanied by the First Lady, Margaret Kenyatta, the president mingled freely with the passengers who scrambled for selfies, hugs and high fives. Particularly thrilled were children who have once in a lifetime opportunity to chat with or even being carried by the Head of State. "Earlier today, I took the SGR train from Nairobi to Mombasa, during which I met and interacted with fellow commuters who shared their interesting experiences about the service. I am glad that the #SGR train services have enhanced travel for Wananchi between the two cities," President Kenyatta tweeted. The Head of State will be at the Coast for the Christmas festivities until January. The president's trip came at a time Kenya Railways is recording brisk business, with Madaraka Express fully booked over the Christmas holiday. Kenya Railways Corporation on December 2 said tickets for the train for most days up to December 24 were fully booked. It is not the first time the president is using the train. In June 2017, during the inauguration of the train he was guarded by seven choppers on air from Mombasa to Nairobi. Last year in December he also used the Madaraka Express SGR train on his trip to Mombasa to open the governors' induction seminar.